Kids are definitely one of life’s greatest joys - but when you’re trying to work from home while also working around their needs and schedules they can become one of the greatest distractions. Even if you’re not working, kids really do require you to be on a lot of the time and, breaking news here, but parents are people too and they need a break sometimes! That’s why when we set out to build our coworking community we knew that childcare had to be one of the major components of the business. As working moms ourselves, we’ve lived through attempting emails between nursing sessions and trying to cram conference calls into nap time. We know what it’s like to reach Wednesday at home and realize you haven’t showered or talked to anyone other than the mailman all week. We know that “mommy finger” can sometimes send chills down your spine. We get it, and we hope we can help make this easier for you. Currently, we are only able to accept children ages 6 weeks-6 years. Our space is built specifically to accommodate that age range and your older kiddo frankly wouldn’t have much fun. If you’re looking for a sitter for your older child, we highly recommend Sitter Getter Home Help. They pre-screen caregivers at no extra cost to you and work to match you with someone who will be the best fit for your family’s needs. On-site childcare means a couple of things! First, we can keep your kiddo for 4 hours maximum. This is a licensing requirement, but it also seems to be the general timeframe for parents to get a lot of stuff done and for kids to stay engaged and not grouchy (hello, sweet nap time!) This also means that you are required to stay on our property while your child is in our care. The good news, though, is that it also means that we avoid licensing costs and are able to offer our childcare at a major discount compared to other facilities! We like to view it as a win-win - you get 4 hours of freedom, your kiddo gets 4 hours of social play, and you don’t have to pay an arm and a leg. When can we come play? Childcare hours can be added to any of our current coworking memberships. We offer childcare packages based on hours to meet the ever-changing needs of kids. You simply select the package that works for you and your hours are yours until they are used. We totally understand that sometimes kids get sick or just need to have a shorter day with us and we don’t believe in charging you for what you’re not using. Your hours are all yours until they’ve actually been utilized! What are your sitters like? We have a lead teacher named Kari who has 10+ years of childcare experience including owning her own in-home childcare business. Kari also has experience with working with many children who have different abilities and more specialized needs. She is with us most days and organizes activities and the general day-to-day operations of our childcare. If she is not here, we also employ sitters from our friends at Sitter Getter. What do they do back there? We offer a free-play style approach to care. 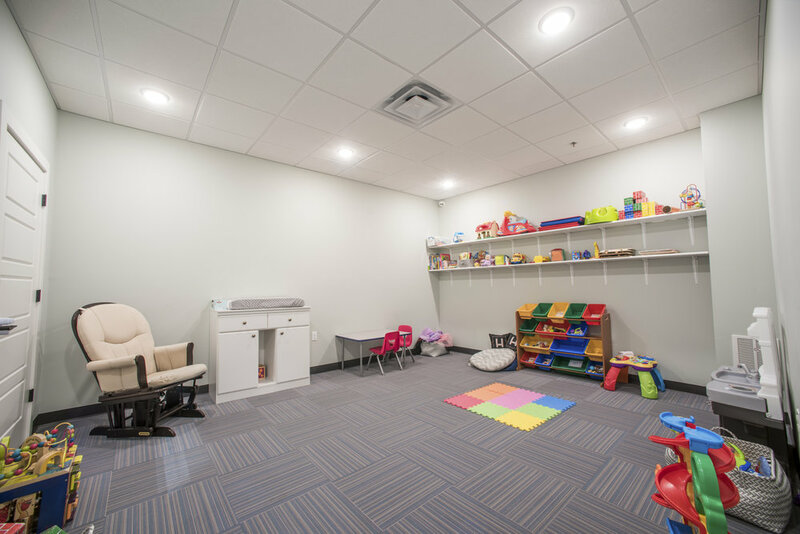 Since the childcare room is built to meet the needs of a relatively wide age group, our days vary! If we have older kids then we may offer a craft, circle time with stories and songs, or other kinds of more structured time. If we have more younger ones then we’re really more interested in letting them learn through play! Our room is stocked full of developmentally appropriate toys, books, and we often play music as well. We do not provide screen time and we also do not allow peanut snacks. If you have more questions for us, please shoot us a message at info@thehatchery.club!